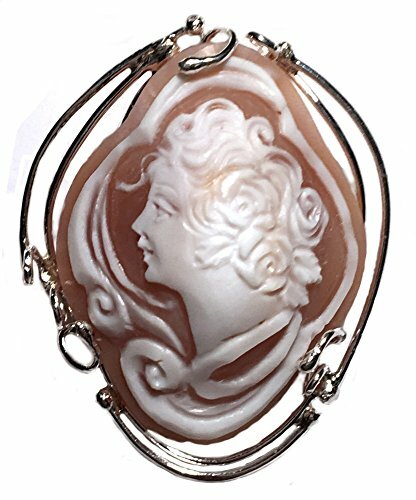 Sea shell cameos are made only in Torre del Greco, near Naples, in Italy. They are created by hand carving individual pieces of double layered sea shells with a steel burin. The artisan attaches the selected piece to the end of a dub stick using special glue. He then begins carving from the softer outer layer which permits the incision of a face or figure, working toward the glassy inner layer which is then cleaned using a rotating brush rendering it shiny. This is an antique art passed on from the Greeks to the Romans which today requires a five to six year apprenticeship to become, given that one has the necessary talent, a master artisan. Black and white sea shells, Cassis Madagascariensis or Sardonic (Sardonyx), come from the Caribbean while the ivory colored shells, called Cassis Rufa or Corniola (Carnelian), come from Madagascar. Each precious cameo is a unique hand made object, an ideal gift of lasting beauty, not a fleeting fad. Note: With time, a cameo may collect dust diminishing its beauty. A soft bristled brush, lukewarm water and neutral soap are all that's needed to restore its original splendor. Great gift or collectors item, exceptional value.